Elica, world leader in the range hood market for domestic use, invites all creative users of Desall to envision an innovative concept of range hood, from an aesthetic, functional and technological point of view, which may be, in one word, revolutionary. Elica Corporation is active in the range hoods sector since the 70s. Today it counts eight factories in the world, between Italy, Poland, Mexico, Germany, India and China; 3,400 employees and an annual production of 18 million pieces between hoods and motors, its two main businesses. Elica is world leader in the design and manufacture of range hoods for domestic use. Dynamism, constancy and refinement have always been the drive behind the change and the search for “New Air”, which has always guided Elica towards unexplored horizons full of possibilities. Elica relies on you, creative users of Desall, to develop a new concept of a range hood for domestic use, in line with the company look and feel and at the same time, which breaks the traditional schemes, achieving a formal synthesis. Envision the innovative, technological hood of the future, also reinterpreting or drawing inspiration from iconic elements. Explore new functionalities, potentials and shapes to realise an unprecedented original product, keeping into consideration its serial manufacturing and marketability. Style: submit original solutions and tell us your story, through a design which might represent you. Explore new shapes, colours or geometries that might define a new user experience. Be inspired by what surrounds you, by what you love, and follow your imagination to create your dream hood. Functionalities: study innovative and smart solutions, elaborate ideas and unprecedented functionalities for the range hood world. User experience: to better develop your concepts, focus on the person, thinking about his/her user experience, his/her needs and the environment where he/she lives and cooks today as well as tomorrow. Think also about the way the life-style, the needs and people habits are changing, the way people interact with objects and how fundamental the user experience has become within the creative process. Range hood typologies: today Elica produces wall-mounted hoods, island hoods, corned hoods, built-in hoods. You can continue to explore these hood typologies or develop new ones. Deliverables: you can use renderings, sketches or other materials to better present your project. A part from the five images you can attach from the upload page (.jpg, RGB, 72dpi), you can also submit a .zip archive containing additional materials (high-resolution images, PDF, etc.). You can also take part in the contest with several proposals. Participation is free of charge and open to designers and creative talents of any nationality aged 18 years or older. Participants can present one or more projects, but only the projects published on the www.desall.com web site, via the upload page related to “Elica Air Design Award” will be accepted. The three winning projects will be the result of an unquestionable evaluation by Elica. The authors of the winning projects will be awarded each €1,000.00. With the payment of the awards, Elica will obtain a perpetual exclusive license for the economical exploitation of those projects. For the non-winning projects participating in the contest, Elica has the right to exert – within 12 months from the end of the contest – an option right that will allow it to obtain an exclusive license for the economic exploitation on the projects the option refers to. For more information, please login and read the Contest Agreement from the upload page. 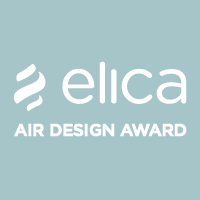 Do you want to stay updated about "Elica Air Design Award"?